Vinyl flooring, also known as resilient flooring has been a favorite floor choice for bathrooms and kitchens for decades. 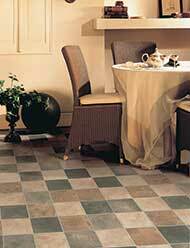 Sheet vinyl flooring and vinyl tile offer the advantage of a no-wax surface that is also scuff and abrasion resistant. A vinyl floor is easy to clean. It is a long-lasting, durable product that will retain its appearance for years to come. Our exciting showroom at FloorCraft in Bellevue boast the most dynamic and innovative manufacturers' showcases around. We chose our manufacturers based upon value, quality, and style. Residential vinyl floor is available in rolled sheets that are 6 or 12 feet wide and in vinyl tiles that are either glued down, come with an adhesive backing or interlocking system. Vinyl advancements has allowed manufactures to mimic the looks of other materials like natural stone and wood with the benefits of using vinyl. Come in today and let FloorCraft show you how to use Vinyl to beautify your home. Vinyl applications are durable, stylish and affordable. Armstrong is the most widely known and respected name in vinyl sheet material. FloorCraft carries the entire Armstrong assortment.